Some Samsung Galaxy Note 3 owners were plagued by these two errors: “Unfortunately, Gallery has stopped” and “Camera failed.” While Gallery and Camera apps are separate, they work hand-in-hand to cater the needs of their users who are fond of taking pictures or recording videos. If the Gallery app is in use, you can easily call on the Camera app and if you’re taking pictures with the Camera, the Gallery app is also working in the background managing those pictures. So, if one failed, the other might be affected as well. In this post, I will guide you through troubleshooting your Galaxy Note 3 that has either of these errors. I will also include some of the emails our readers sent us that are related to these issues. For those who have different issues with their phone, I suggest you visit our Galaxy Note 3 Troubleshooting page as we have listed hundreds of solutions to problems sent by our readers. Find issues related to yours and try our solutions. If they didn’t work for you, then email us at [email protected] but please provide as much details as possible so we can properly assess your concern and provide you with appropriate solutions. 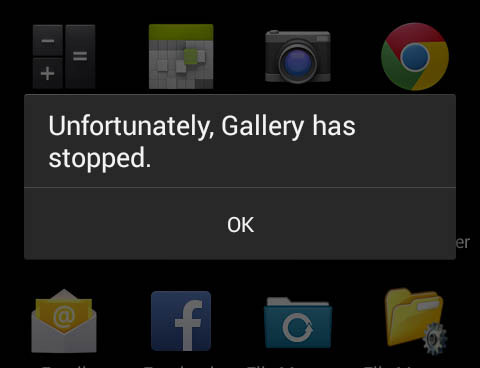 It is apparently an app-specific error involving the built-in Gallery app. Assuming you don’t know what caused the error, you will have to troubleshoot it starting with the Gallery itself. The safest way to deal with it is to clear the cache and data of the app. Scroll down to find the Gallery and tap on it. This procedure is very effective if the Gallery app has crashed for some reason. Here’s one email from our reader that says clearing the cache fixed her problem. There are times when clearing the cache works but more often, you really have to clear the data. In the case of the Gallery app, you really don’t have to worry about losing some of your pictures or videos because they will never be deleted if you cleared both the cache and the data. Here’s another problem that may be fixed by this procedure. Problem: Hello guys. I own a Galaxy Note 3 and it lags when I open the Gallery followed by an error that says, “Unfortunately, Gallery has stopped.” I noticed that the error comes out when I have new pictures and there’s no internet connectivity. But even if I have pictures and there’s internet, the error won’t come out. I’m really confused why the error only comes out if there’s no connection and what has the internet got to do with Gallery? Can you shed some light into this matter please? Again, clearing the cache and data might solve this problem but as what the owner said, the error often comes out when there’s no internet connectivity and if there are new pictures. It could also be that the error is triggered by auto upload feature. More often, Gallery will make a backup of new pictures through Google+, so turning off auto backup or auto upload may fix this problem. Moreover, it is imperative you know the app the Gallery uses to upload pictures and uninstall it. Now, here’s just another problem related to ones I mentioned above only that the error doesn’t occur all the time. Problem: My Note 3 is doing some crazy things now. I have thousands of pictures in my phone and prior to the update, I can view them easily through the Gallery. Now, when I open the gallery, it will freeze for a few seconds, then lags and sometimes shows an error saying “Gallery has stopped.” I did install a third-party gallery app but it just made the case worse because when the phone freezes, I will have to reboot it to be able to use it again. What can I do to fix this problem? I hope the problems I cited here as well as the troubleshooting procedures can help you fix related issues with your phone. Problem: Hello. I recently dropped my phone waist high on a carpeted floor. I think the drop didn’t cause any damage because it didn’t even chip off the paint. But the thing is, there’s one error message that keeps popping up whenever I open the camera. It says “Camera failed” and it happens every single time I use the camera. I really don’t know when it started because it’s been a long while since I last used the phone to take some pictures. Could it be possible that the drop caused this? It is always possible that the impact somehow affected the camera of the phone. But as I said earlier, it is difficult to rule out the problem hardware-wise. So, you need to troubleshoot the problem ruling out the possibility of a software error, after all, the camera in your phone means two things; the Camera app and the sensor itself. Scroll down to find the Camera and tap on it. The procedure will rule out the possibility that the error message was caused by a conflict between the Camera app and a third-party app. If the error still pops up after that, then you have no other choice but to hard reset your phone to rule out the possibility that it is a firmware error. If the problem goes beyond this point, it’s a hardware issue and you need a technician to check your phone for you.